As well as playing host to a parade of cruise ships plying the waters of the Inside Passage during the summer months, the Broughton Strait can brew up some interesting storm watching. Sointula is situated on the fringes of Broughton Strait on Malcolm Island, where residents and visitors alike can watch as the forces of nature boil over. A rainbow is a welcome sight at the end of a storm or heavy rain when the sun peaks through the dark clouds once again. Rainbow, Sointula, Malcolm Island, Broughton Strait, off Northern Vancouver Island, British Columbia, Canada. 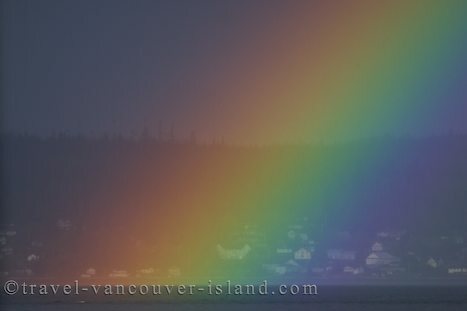 Picture a vivid rainbow with Sointula in the background on Malcolm Island, BC, Canada.